I promised you my Chinese braised soy sauce eggs recipe (滷蛋) in the Taiwanese scallion oil noodles (葱油拌面) post, so here you go. This is a super easy recipe, and the best thing is that you can save the braising soy sauce stock (滷水汁) in the fridge and re-use it again to make the eggs or even tofu (bean curd). 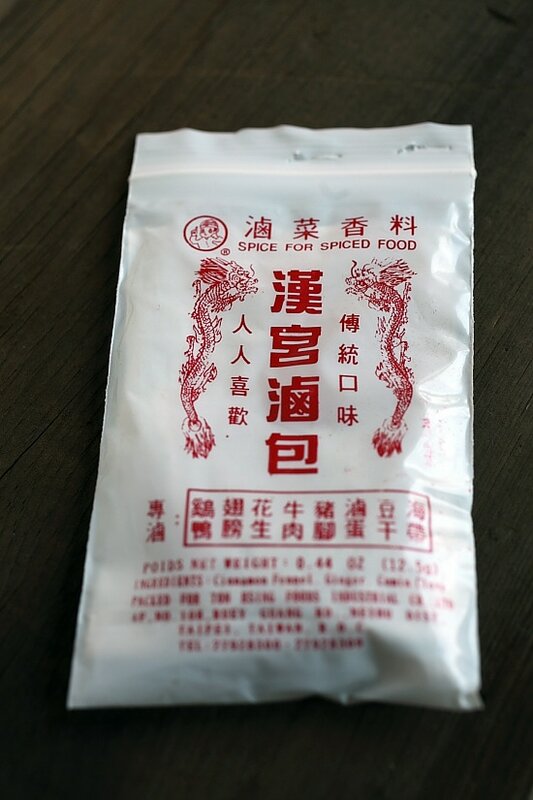 One ingredient that I like to add to my braising stock is a spice tea bag used for braising a variety of foods—chicken, pork, beef, peanuts, seaweed, tofu, etc. It’s available at Asian stores and they are cheap and handy. It’s optional but a tea bag of the spice adds to the aroma and overall flavor. To make perfect hard-boiled eggs, please refer to this kitchen tip by Good Life Eats. Chinese Braised Soy Sauce Eggs (滷蛋): Super easy recipe, you can save the braising soy sauce stock (滷水汁) in the fridge & re-use it for eggs or tofu. Prepare the hard-boiled eggs. Peeled off the shell and set aside. Heat up the water in a pot and bring it to boil. Add the rest of the ingredients (except the eggs) into the pot. Lower the heat to medium and boil for about 15-20 minutes, or until the stock is reduced and infused with the aroma of the star anise, cinnamon, and also the spice tea bag. Add the eggs into the stock and let steep in the stock for a few hours, you can lower the heat to simmer if you like. For the best result, leave the eggs in the braising stock overnight to further develop the flavor. Dark soy sauce doesn't have much flavor, it's used to add color to the food. The amount you use depends how dark you want your eggs to be. I like it darker. Over-cooked hard boiled eggs don’t bother me as I hate it when the egg yolk is not quite set. For this recipe, I think it’s hard not to overcook the eggs since they’re steeped in the stock. I love braised pork and eggs so I’m sure I’ll love this recipe too… can’t wait to try it! Nice..I was just craving braised soy sauce eggs :) Good timing. thanks for sharing. my husband and i love these. i can’t wait to make them. Never had these, so are the shells left on the eggs until eating? Oops, forgot about the step in the recipe. No, the shells are peeled off before steeping in the soy sauce mixture. I always love eating hardboiled eggs with kicap manis… and was introduced to this dish by my husband… and love it eversince. using their stock for as long as they are in business? doesn’t that pose threat to people’s health?. However, stock tend to become richer and tastier the longer it simmers. How long can you keep the egg in the broth for? Up to a week? A couple of days in the fridge. yummy! Love braised eggs, goes with so many rice and noodles. Gong Xi Fa Cai! Hi! What exactly is spiced tea bag? Check the picture of the spiced tea bag. It’s made of several spices for braising purposes. not sure if you are still reading this comment page. can you recommend the dark soy sauce you used in this recipe. I like my braised egg to be darker but my dark soy sauce doesn’t give me that dark look. I am currently using the brand “Pearl River Bridge” but hope you would recommend other dark soy sauce. hi rasa — great recipe! i just made these last night and i have couple questions. do you leave the spice tea bag in the braising liquid the whole time? and where do you leave the eggs / liquid overnight? i put them in the refrigerator last night…do you leave yours on the stove or in the fridge? thanks rasa! i’ll leave them on the stove next time. how do you get the flavor deeper in the egg? i had my eggs soaking all night (with the tea bag in the fridge), and the flavor got pretty deep into the whites, but not quite to the yolk. I saw a recipe similar to this some time ago, called “Chinese Tea Eggs”. One difference … they left the shells on the eggs, but cracked them all around the outside with a spoon. Then when they boil in the tea, they get this great pattern. When I made them though I didn’t boil them … I just put the eggs in a jar with the cracked shells, poured the soy sauce tea mixture over them, and let them set in the refrigerator overnight. Actually a few days, as I ate them. I just peeled them before eating. Hi, i tried the receipe. However i have left over broth/stock/seasoning. how should i keep it so that i can reuse them again? Must we boil the egg first. Can I not put the raw egg in the braise liquid? Hello – these look wonderful however the link for the spice tea pack no longer works. Is there an alternate link you could reply with? Hi, can i add chicken wings to this recipe?